Looks pretty drab to me! I remember eating these for lunch when I was in high school. They were pricy and therefore a special treat. I loved Deviled Ham, too. I wish that they made these again. I think I lived on this while in college. It was fun seeing this again. Thanks for sharing! I LOVED Spreadables! So good on little “Party-Rye” bread. Mmm. I believe the chicken salad was the best one. I remember this. I didn’t like it too much, it was too sweet. Like with Miracle Whip in it instead of mayonnaise. well, it does state that it IS made with dressing. That could be any type of dressing. So, it could just possibly be made from miracle whip. think the sweet flavor came from capers, but I can not be sure. It was a little expensive at $1.79 in 1972, but very good quality. 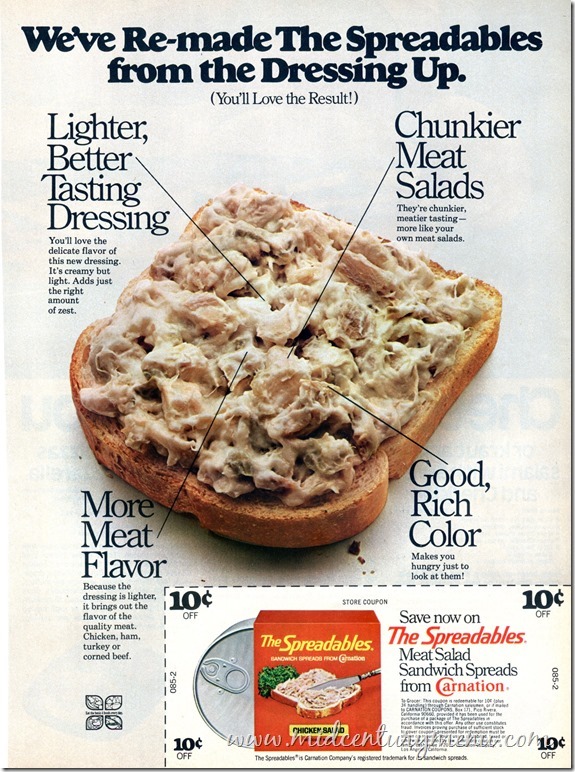 Loved both the ham and chicken salad spreadables as an easy sandwich weekday option. Wish they still made them. When & why we’re they discontinued a nd will they come back? When we were kids in the 70’s this was a treat for us. Mom didn’t work and there were 4 of us kids home from school in the Summer. A special lunch was to walk to the store (just “up the field”) and buy a pack of Spreadables, a 2 liter coke, a bag of Munchos, and a box of “Ho Ho’s”. LOL. We LOVED days like that. We didn’t have a lot growing up but we had a lot of fun!!!!!! Good times!!!! Does any company make a chicken salad spreadable or ham salad spreadable now? I loved the Carnation Brand of the 1970’s. Used to buy it at the Ft. Jackson Commissary. I wish you would bring them back. They were delicious! !